The environmental section conducts much of the Geographic Information System (GIS) mapping for various divisions in GLIFWC and produces many of GLIFWC's cartographic products. 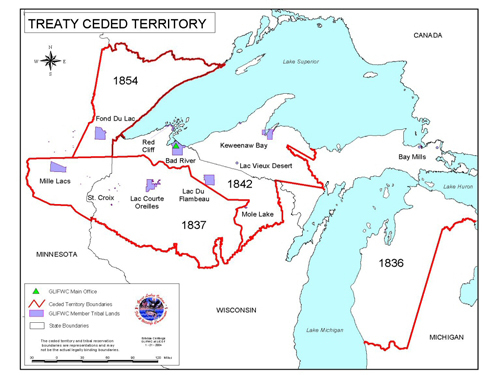 These products include the mercury maps mentioned above, as well as the Ojibwe language map and atlas that was developed in cooperation with language experts within GLIFWC and our member tribes, ceded territory maps (see below), and several maps used in the Mazinaigan. Much of the mapping activity is linked to the review of proposed mining projects, as well as the analysis of the impacts of past mining. One of these projects mapped the extent of mine wastes in the vicinity of the buffalo reef spawning area in cooperation with the National Water Research Institute of Environment Canada.